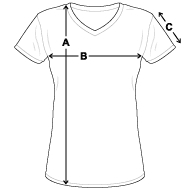 Women's V-Neck T-Shirt is in stock. We will print it as soon as you order it. This contoured, classic cut V-neck T-shirt has that flattering style that’s sure to turn some heads. It’s great for layering under a sweater or sweatshirt and even better by itself with a pair of jeans. It’s a good idea to own this one in a few different colors; it’s definitely a go-to item. The product ran a little smaller than expected, but the design an picture came out perfect. Your sizing is way off. I may be fat but I'm generally a 2x in Women's Plus Size. I ordered a 3x and it did not fit very well. Like shirt except lil sm. Not worth pay extra S/H to exchange. I like 2 other shirts 1 shows 1/4 other 3/4 two different print lengths & given no choice (like full length). Been debating buying them for time, cost + $*** & not paying extra S/H so stuck with. Also very worried how much will shrink. Words in a collage from the Matthew 22:36-40.